Over 200 stores across Australia and Singapore. Part of Retail Food Group which has over 2,500 outlets in over 80 international licensed territories. 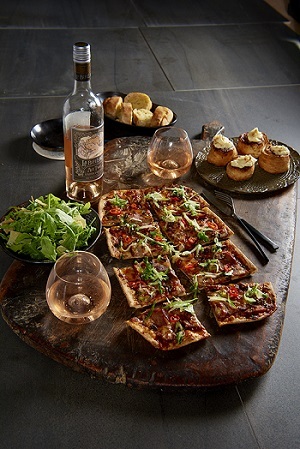 Established in 2001, Crust Gourmet Pizza Bar is the number one gourmet pizza franchises in Australia with over 200 stores. With a master franchisor now secured in the UK, this innovative brand is set to expand throughout the country. Crust is the original innovator in the pizza space and brings true firsts to market, from unique flavour combinations to product formats and service innovation. Crust prides itself on delivering the promise of “Pizza Reimagined” with flavours and product offerings that are ahead of global food trends. Crust makes pizza the authentic way, relying on instinct and measuring by hand rather than following a strict formula. We also offer a halal option/menu giving us another key competitive advantage. Perfected over 25 years of operation, RFG now has a strong portfolio of world-class franchise systems - Crust Gourmet Pizza Bar, Gloria Jean’s Coffees, Donut King, Brumby’s Bakery, Cafe2U, Michel’s Patisserie, It’s A Grind, The Coffee Guy, Pizza Capers Brand Systems - with an extensive global footprint of over 2,500 outlets in over 80 international licensed territories. RFG is Australia’s largest multi-brand retail food franchise operator. “I am excited to join the RFG family and am confident that Crust Gourmet Pizza Bar will be well received in the UK. RFG and its Brand Systems have a great reputation, a quality product offering, and fantastic benefits for Franchise Partners and | look forward to working with the Company and introducing locals to gourmet pizza like they've never experienced. Crust is both a take-away and dine-in gourmet experience with most stores offering an intimate seating area; store size is generally 75m — 100m (807ft - 1076ft*), with larger options for a full dine-in experience available. We focus on creating the feel of the local gourmet pizzeria, and our fit out talks to the boutique, individual style associated with this concept. Although there are some similarities in the branding of all our stores, every store fit out is unique, with its own flavour and personality. Proven system: A business model that is proven to work for others can give you the confidence that it can also work for you. Crust is an established brand with over 200 stores. By following the system outlined by your franchisor, your new business benefits from the experience of an established enterprise. By filling in the form below you will be able to download a copy of the Crust Gourmet Pizza Bar prospectus.